Senior Citizens—Once there is a tribunal of three members, the District Magistrate has no jurisdiction to take decision alone and the decision has to be taken unanimously or by way of majority. 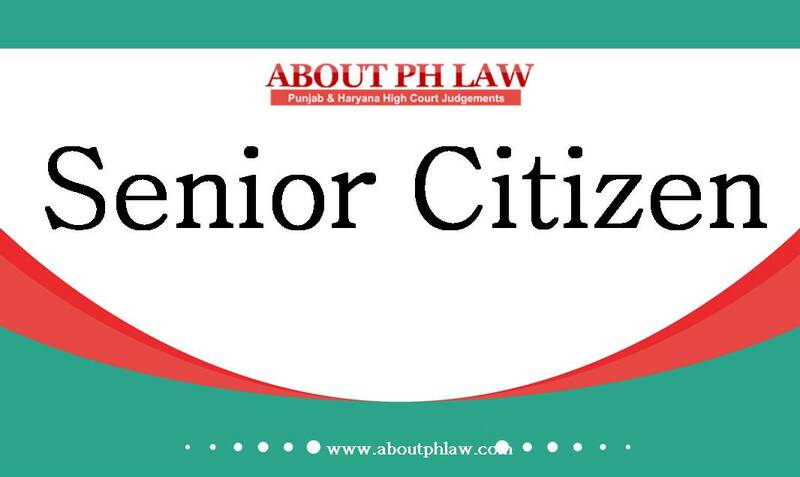 Comments Off on Senior Citizens—Once there is a tribunal of three members, the District Magistrate has no jurisdiction to take decision alone and the decision has to be taken unanimously or by way of majority. Senior Citizens—Eviction of Son—Parents filing application for eviction of son during pendency of civil suit by son claiming ownership—Application is maintainable. Comments Off on Senior Citizens—Eviction of Son—Parents filing application for eviction of son during pendency of civil suit by son claiming ownership—Application is maintainable. Senior Citizens—Eviction—Son had contributed to the finances for the purchase of property—Not a relevant factor to decide the application. Comments Off on Senior Citizens—Eviction—Son had contributed to the finances for the purchase of property—Not a relevant factor to decide the application. Maintenance and Welfare of Parents and Senior Citizens Act, 2007, S.22–Execution of Orders-Deputy Commissioner is empowered to direct the police authority to implement the orders passed under the Act—Senior Citizen would be entitled to take recourse to mechanism provided under the Act and Rules-Contempt petition is not maintainable. Comments Off on Maintenance and Welfare of Parents and Senior Citizens Act, 2007, S.22–Execution of Orders-Deputy Commissioner is empowered to direct the police authority to implement the orders passed under the Act—Senior Citizen would be entitled to take recourse to mechanism provided under the Act and Rules-Contempt petition is not maintainable. Maintenance and Welfare of Parents and Senior Citizens Act, 2007, S.22–Shared household–The daughter-in-law cannot be said to have a right in the house of father-in-law/mother-in-law, who lodged a complaint against the parents of husband and caused harassment to old aged in laws. Comments Off on Maintenance and Welfare of Parents and Senior Citizens Act, 2007, S.22–Shared household–The daughter-in-law cannot be said to have a right in the house of father-in-law/mother-in-law, who lodged a complaint against the parents of husband and caused harassment to old aged in laws. Maintenance and Welfare of Parents and Senior Citizens Act, 2007, S.23 & S.27– Eviction Order-Challenged-Father was a senior citizen and absolute owner of the house-Son and daughter in law forcibly took possession of first floor of house—Held; Both are only licencee—No illegally or perversity in impugned order-Order Upheld. Comments Off on Maintenance and Welfare of Parents and Senior Citizens Act, 2007, S.23 & S.27– Eviction Order-Challenged-Father was a senior citizen and absolute owner of the house-Son and daughter in law forcibly took possession of first floor of house—Held; Both are only licencee—No illegally or perversity in impugned order-Order Upheld. Senior Citizens—Against the order of Tribunal, appeal lies only at instance of Senior Citizen or Parent and appeal preferred by son or daughter is not maintainable. Comments Off on Senior Citizens—Against the order of Tribunal, appeal lies only at instance of Senior Citizen or Parent and appeal preferred by son or daughter is not maintainable.